Medihealing® – A combined meditation and healing that merges the benefits of mindfulness meditation with Pure Source healing frequency. Relax in a meditative state, sitting, standing or lying down, as Mas works on your frequency blueprint to raise your vibration and awaken your own power for self-healing and life transformation. Following his very successful live in-person Global Healing debut in Toronto last April, Mas Sajady has been invited to return to Toronto to share more of the abilities he gained through his two near death experiences. To be able to bring the healing benefit to as many people as possible, Mas Sajady has made this Global Healing session a Public Service event. All are welcome to attend free of charge. Spaces are limited, so early registration is highly recommended. Using the Power of the Group Mastermind to Propel Forward Mas invites all to participate in this In-Person Live Global Healing event from the purity of their hearts, and with a sincere desire to heal and evolve; personally and globally. This is not an ordinary session. Anyone and anything Mas works on during this event will benefit from the Pure Source frequency, which will be further amplified by the powerful energy generated from the global consciousness. Those in attendance will also receive Pure Source frequencies for themselves. 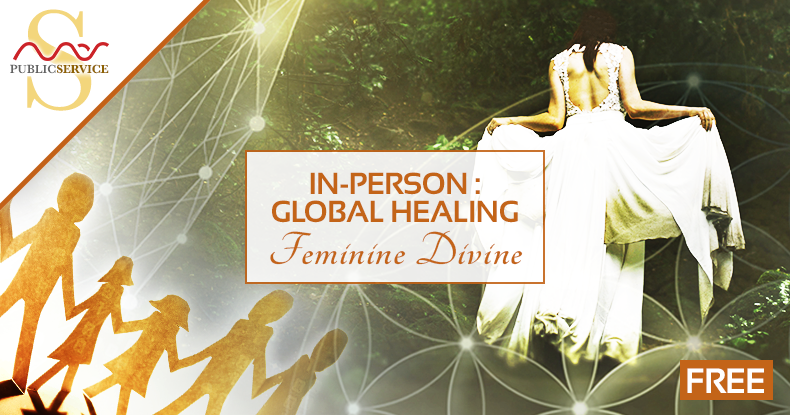 The theme for this Global Healing Session is Feminine Divine. The feminine energy through divinity gives birth to the Masculine which in turn gives rise to its own divine energy, as the feminine divine is a 'home' or 'cosmic mother' for all of creation. People of any gender and non-specific gender are all connected to the divine energy of the feminine. For the feminine energy, when tapped into at its divine origin, is the route to the Higher Self, and to healing the Soul. Our connection together will also radiate Pure Source frequencies for Global Healing. Mas will facilitate a Medihealing® on "Exponential Intelligence – Feminine Divine" for everyone in attendance, and for Mother Earth and all her inhabitants. All proceeds for the Private Reception will go to the Women Empowerment Program. *Includes Meet & Greet and Hands-On Healing. *All proceeds for the Private Reception will go to the Women Empowerment Program. FREE In-Person Global Healing "Feminine Divine"
"An Evening of Knowing & Deserving"